Michael Skidmore is a senior researcher at the Police Foundation and for the last three years has led a portfolio of work which has focused on serious and organised crime and the response from local and national enforcement. 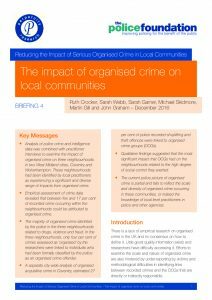 Specific themes include fraud, child sexual exploitation and modern slavery, as well as the methods of police and partners for understanding, prioritising and addressing harm caused by organised crime. 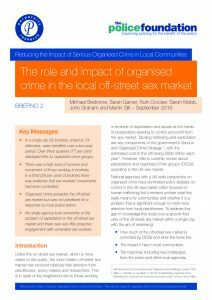 Previously he worked at the Home Office and led on research profiling organised crime offenders and before that completed research in prisons and other custodial environments to inform inspections and thematic reports by HMI Prisons. He also has extensive prior experience as a support worker for ex-offenders in the community and has an MSc in forensic psychology from London Metropolitan University. 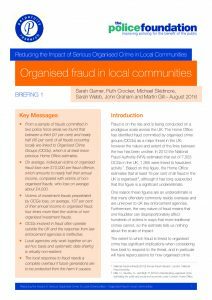 So a large portion of fraud is linked to organised crime – what are the implications for the police?